Experience. I buy one pair of icers a year. The sharp points flatten out quickly and are no longer sharp, after only wearing a few times.But thy still function with any metal present. Many have bolt heads now for studs and no sharp points-recommended. They can be slippery on porcelain tiles, meaning one must walk carefully moving the feet vertically up and down. with mincing steps. I have bought them all and experimented. The old spring type are very dangerous except on packed snow. They should be banned. That use to be all one could purchase. They do not mark floors. I have tested them all. The pointed studs might mark a bit when first new. I put the icers on a separate pair of boots. It is not convenient to remove them. One can have a separate pair or shoes for convenience. They should be used to reduce the number of falls. I don’t even step outside without the icers on. All one has to do is fall ONCE to have major damage. https://www.llbean.com/llb/shop/43355?page=stabilicers-lite Many stores sell them now often at inflated prices. 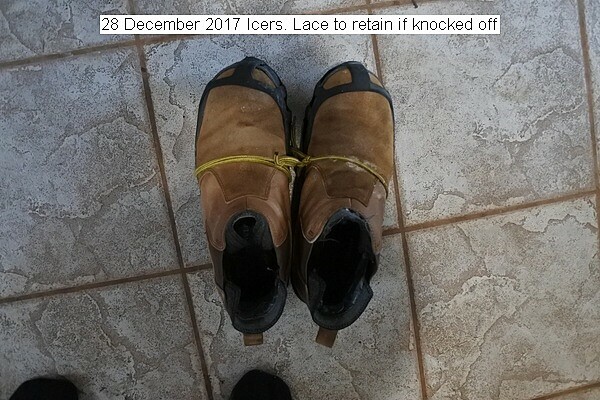 This entry was posted in Uncategorized and tagged 28 December 2017 Icers. Bookmark the permalink.